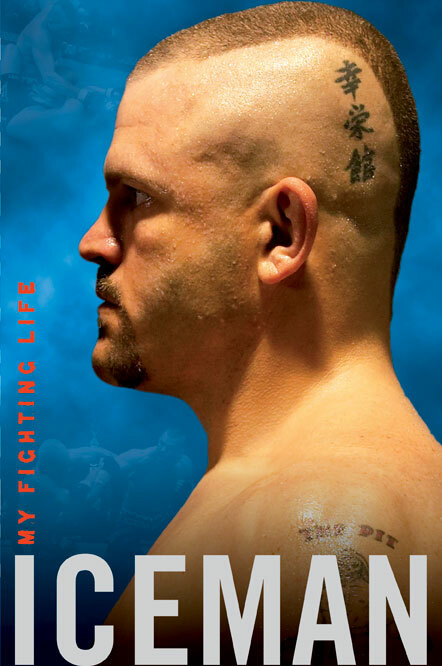 “Iceman – My Fighting Life”, is the autobiography of the UFC Fighter and Champion, Chuck Liddell. This book charts the life of Chuck from childhood, through his training in a number of fighting styles and on into the UFC and MMA fight arena. The book is a New York Times Top Ten Bestseller and the from the cover of the book it should be clear what the contents will be all about: simply a large, side on headshot of Chuck Liddell himself. In a lot of autobiographies, the author spends a lot of time recalling their childhood and teenage years, and in some books we can be halfway through the story before we start to hear about their famous activities. While Chuck does start down this traditional route, it is mainly focused on fighting and his early experiences with training. We hear how he started in Wrestling and American Football for his base fitness, and then started training in Koei-Kan Karate. This leads on to national competitions and his black belt test. Liddell gives us examples of his wrestling matches and some fights that took place while on nights out with friends. Chuck paints a good picture of his youth and it helps us understand how he became a UFC champion. Liddell covers how he met his trainer and started training in Hawaiian Kempo and ties in how the Ultimate Fighting Championship started and that as its popularity grew, more people were telling him he could ‘thrive’ in that environment. Chuck would go onto win championship titles for Kickboxing in both the USMPA and WKA organizations before planning his move into the UFC. In the following two thirds of the book, we hear how he got his break in the UFC, some of the politics involved, movement to Pride, then back to the UFC, preparations for fights, thoughts on the fights themselves, championships won, rematches, his time on the Ultimate Fighter TV programme and more. This part of the book is why most people would have picked it up and it’s a really interesting insight into the whole package of Mixed Martial Art fights from a fighter’s personal perspective. As we travel to the end of the book we get a brief look at Liddell’s perspectives for the future (although the book was written in 2008 and Chuck had further MMA fights until his retirement in 2010). The book closes with an appendix which covers Liddell’s MMA fight record up until August 2008 with a brief paragraph about each fight, before finishing off with a list of the UFC rules. I really enjoyed this book and didn’t want to put it down. I never knew Chuck Liddell had a traditional martial arts background and it was really interesting to read his story of how he grew into this fighting machine and made his way in the world of MMA. It is a thoroughly enjoyable read and is laugh out loud funny at times! There are 47 chapters and each of them has a great title hinting at the story within. Chapter titles include, ‘To leave no doubt, you’ve got to knock a guy out’ and ‘Size doesn’t matter’. I would recommend this book to everyone, martial artist or not, as it’s a vibrant story of one man’s exceptional growth and success in his chosen sport, highlighting how seeminginly unconnected events can lead to success in emerging fields and sports. The paperback version of this book is still in print and readily available from bookshops and online book retailers. I personally would recommend it as the perfect Christmas purchase if you are looking for that stocking filler for your martial arts fan friends, boyfriends, or other members of the family -it really oozes quality. ‘Without good cardio, every fighter will lose most of his strength – as much as 80 percent of it – early in a fight. It’s not about strength: it’s about strength over a long time’. Fun Friday - Happy Holidays From Master Ken !